Today is the official release day of Manda Benson’s DARK TEMPEST (Lyrical Press). It’s a science fiction romance with a pretty nifty cover to boot! 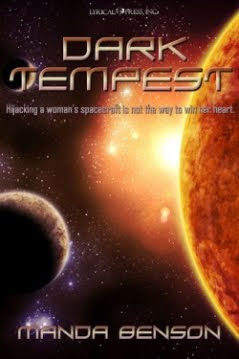 Hijacking a woman's spacecraft is definitely not the way to win her heart. Gerald Wolff is a convict blackmailed into hijacking the ship belonging to Jed, a star Archer and descendant of one of the highest Blood lineages in the known galaxy, while he is but an outcast half Blood. Jed has found Equilibrium by adhering to a strict code. Wolff’s intrusion into her ship and her life upsets the balance of her obsessively controlled world. His very presence confuses her, yet they must work together in order to discover why they are being hunted, and to stay one step ahead of their pursuers. Science—ha! I guess what they mean by that is “Beware content that may stimulate your brain as well as your nether regions.” I love me some paradoxical warnings. Read an excerpt of DARK TEMPTEST here. Pssst—don’t look now, but I think with all that talk of polymers and organic synthesis, she’s trying to turn us on!